Needless to say, I didn't attend the reunion. I try my best to avoid situations where I might accidentally hear one note of Starship's "We Built This City." In a strange coincidence, some of my friends who didn't attend my high school organized a gothic/punk/industrial 'club kid' reunion the weekend prior to my high school reunion. During the early-to-mid '80s, the midwestern city I lived in had a great alternative music club scene. We would spend most of our evenings dressed in black and coiffed outrageously, dancing to Bauhaus' seminal track "Bela Lugosi is Dead," Joy Division's "Love Will Tear Us Apart," amongst other doomy, angsty, deep cuts and non-hits. Going back to my hometown and dancing with old friends to great music was one of the highlights of 2015. Yes, I dressed in black. Well, let's segue into the review. 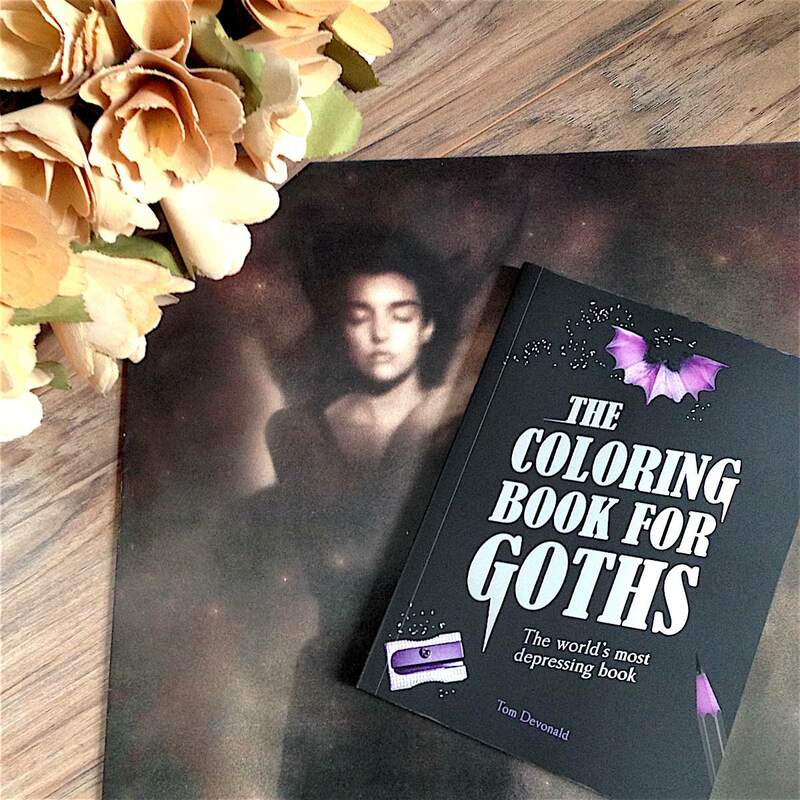 The Coloring Book For Goths is a humorous coloring book requiring only one color: black. Geared to the current coloring book fad, it has one joke. Once you color it in, the page turns completely, thoroughly black. Featuring crows, black widow spiders, pentagrams, coffins, and crypts, and making references to Edgar Allen Poe, Robert Smith, and Friedrich Nietzsche, the book often only makes a passing reference to the goth subculture. Some pages are funny and clever – a page of Metallica lyrics, pages exploring oblivion, the unknown, and the unknowable – but there are just as many embarrassing pages that belie a rudimentary understanding of the culture. An insecure killer whale? A polar bear in witness protection? Embarrassing tattoos? Unfortunately, someone enveloped in the goth culture would probably never purchase this book, and tourists to the culture probably won't come away with a better understanding of it. It both embraces and pokes fun at the culture. Still, it was cute and made me snicker, because while we may have a serious demeanor, goths (and former goths) can take a joke. My family came late to the Arrested Development series, and so we’ve been binge watching it on Netflix. The series is narrated by Ron Howard, and also narrates this very good Arrested Development: Star Wars sketch from The Star Wars Show. Spoilers, of course.